When a lot of people think of “corn bread”, they picture the soda-risen American style quickbread that’s a staple in American culture with endless personalized recipes handed down from grandmothers. Well made, it’s delicious and relatively fast to produce. This isn’t that. Just wanted to get that out of the way. 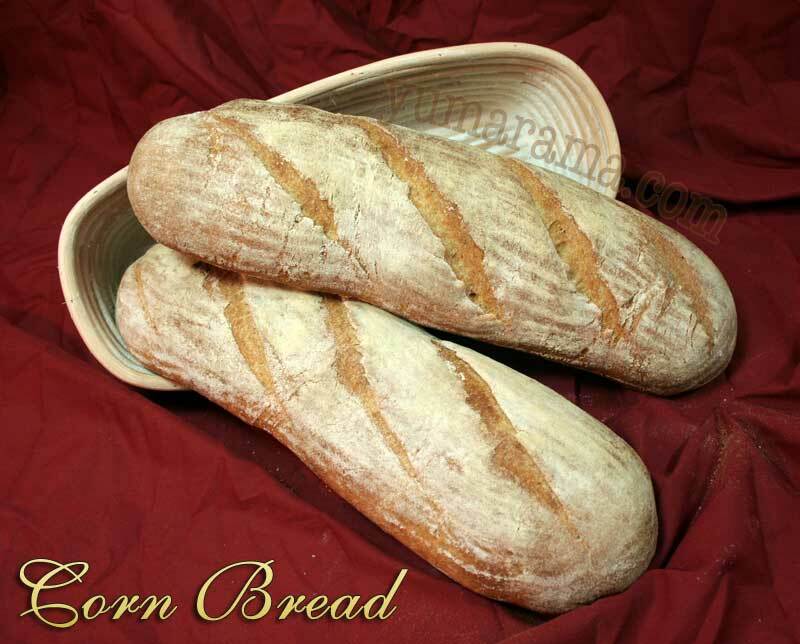 This is a yeasted bread made with corn. 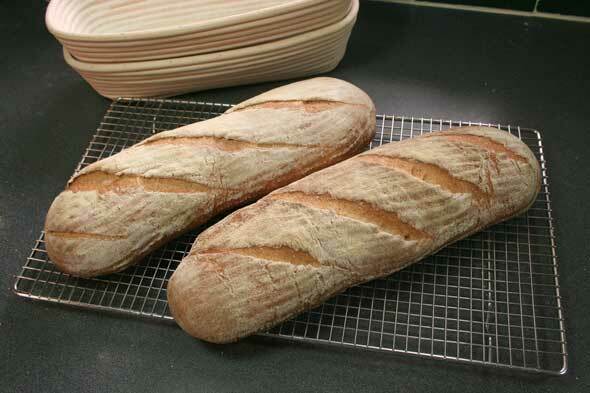 And it’s made with a pre-ferment so that a lot of flavour is drawn out of the wheat flour. Unlike it’s quickbread counterpart, the crumb is … well, I won’t give too much away quite yet, we have a whole process to get through before we get into the final results. There’s a sneak peek of it in the header pic but let’s see how we got there, shall we? NOTE: At this point, the Mellow Bakers’ trip through the book is long done but you can certainly follow along with us on that site and bake whatever breads you feel like tackling and any order you wish! As noted, this bread is made with a pre-ferment. 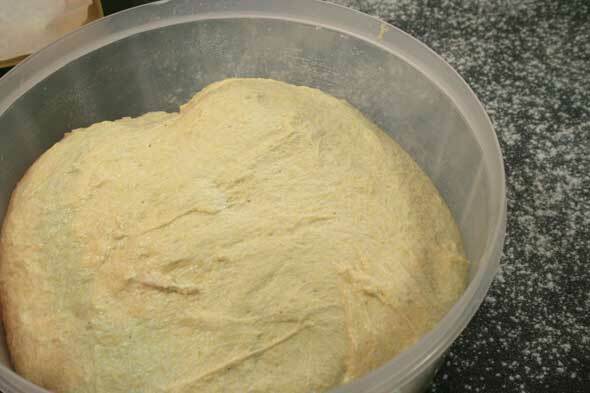 This means that some of the final dough is made ahead of time and allowed to “age” and get the flavours developed before doing the entire batch. This pre-ferment is made with 8 oz of bread flour, 8 oz of water (both by weight of course) and tiny 1/8 teaspoon of Instant Dry Yeast. It is made the evening before (in my case anyway) and left to pre-ferment for 12 to 16 hours. Mine went 14 hours. 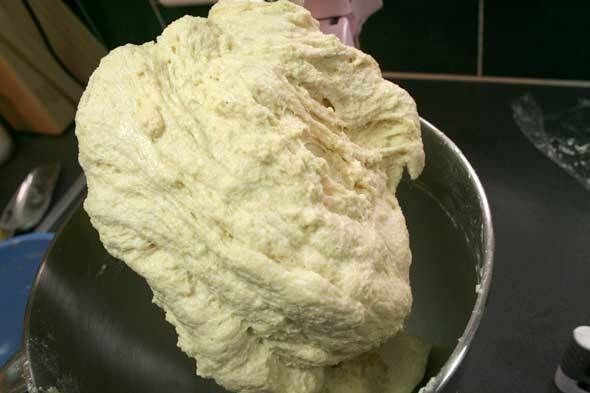 As you can see, the result is a bubbly, soft 100% hydration dough. 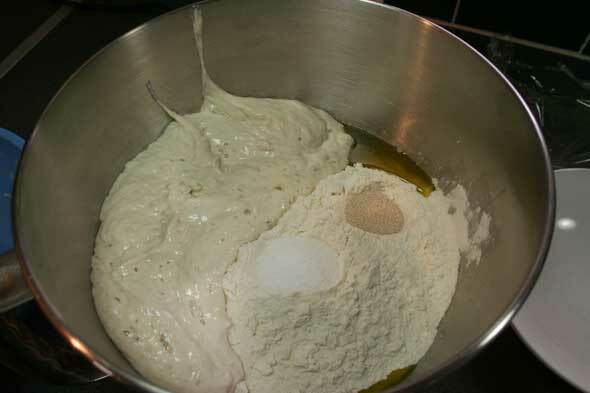 For this bread, we have gathered here the following: Bread flour, salt, Instant Dry yeast, olive oil, fine cornmeal, water and our pre-ferment. Gathering all the ingredients and setting up for this photo, I looked at the ingredient list in the book and see that the cornmeal listed in the recipe is noted as 8 oz (that’s 227 grams) and the volume equivalent as 1/4 cup. Well, as you can see in the photo above, 8 oz (by weight) of cornmeal is a fair bit more than 1/4 cup. In fact, I got 1-1/3 cups. Fellow Mellow Anne Marie weighed 8 oz of her cornmeal and got 1-3/4 cup so I assume different varieties may weight a bit more or less. But what it is NOT is 1/4 cup of cornmeal. Make sure to correct that in your book or, better still, just don’t use volume measures! Always weigh stuff out. See the post How big is a cup? for some explanations. That minor blip noted and avoided since I convert and weigh everything in grams, I move on to the next step. 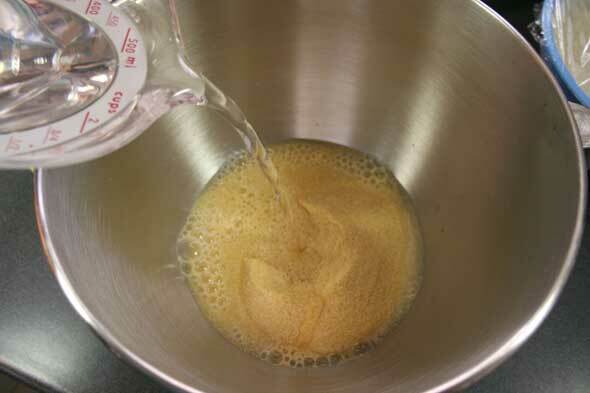 I pour the 227 grams of cornmeal into the bowl and add the lukewarm water. This is left to soak in for about 10-15 minutes to soften the cornmeal. Then all the remaining ingredients are added including the pre-ferment. This is mixed for about 3 minutes on speed 1 until incorporated. The dough is put in a greased bowl to do it’s bulk proofing thang for 90 minutes with one stretch and fold at the 45 minute mark. 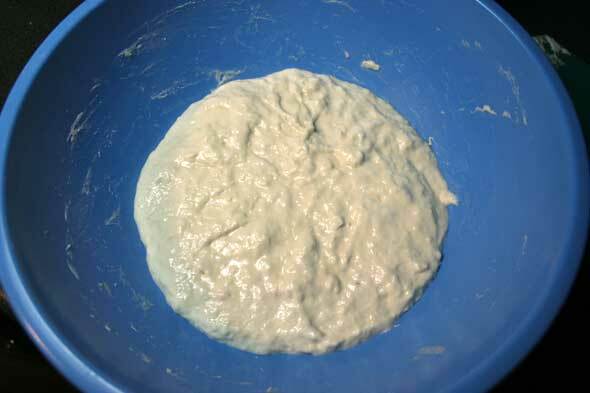 The centre photo shows the dough having just been folded and returned to the bowl, the next is at the end of the 90 minute bulk proofing, showing it had just relaxed and spread out a bit. I then turn out the dough and, using the metal bench scraper, cut the dough in half. 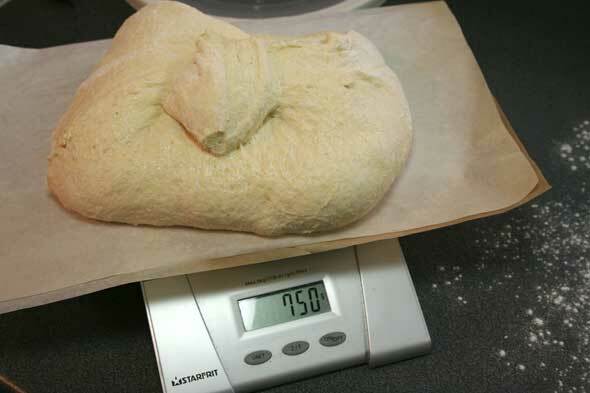 I had weighed the dough out ahead of time and saw it was 1500 grams exactly so it was easy to figure each loaf would be 750 grams. 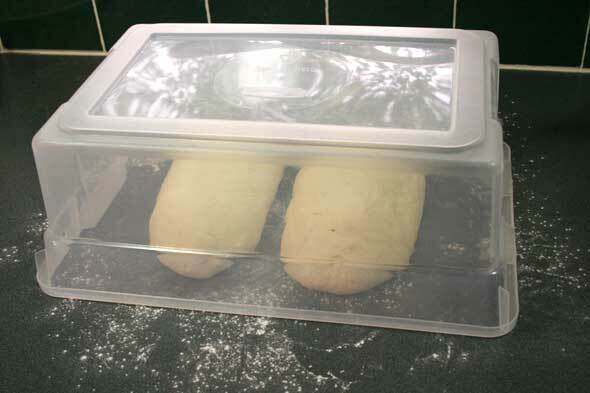 I’ve marked how much each of my plastic tubs weigh on the bottom in permanent marker so it’s easy to subtract that from the total weight of any dough. 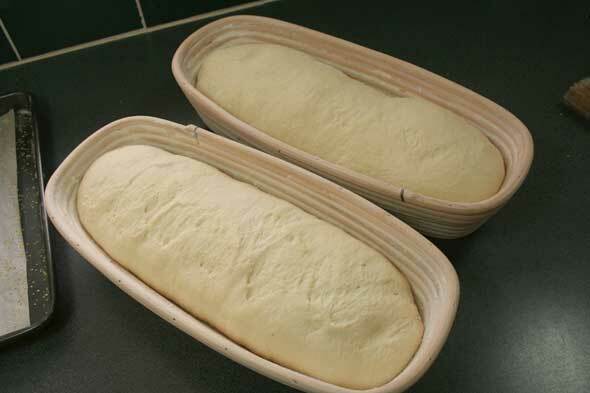 Having split the dough in two, I gently pre-shaped the loaves on a lightly floured counter – this dough is a bit tacky – and cover them to let them relax for about 15 minutes. 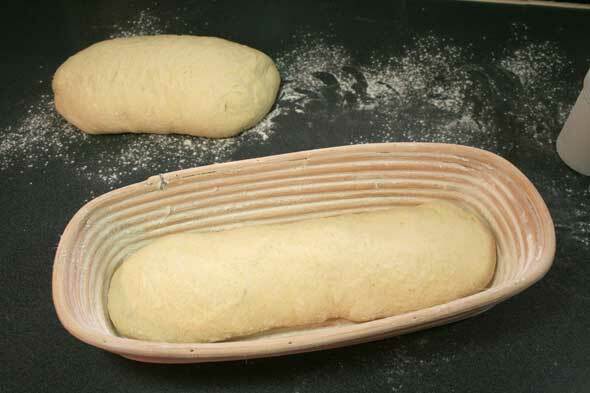 After the rest, I gently shaped one of the loaves into a flat-ish rectangle-ish shape and roll it into a long loaf form to fir the pre-floured cane baskets. Repeat for loaf no. 2, cover and let proof for 1 to 1-1/4 hours. Unlike last time, I want to make sure to check they’re not overproofing so I’ll be doing the ol’ “poke test” at about the 45 minute mark. At about 30 minutes before the dough is expected ready, I fire up the oven to 460ºF and place a pan in the bottom to get ready for some steaming. A poke test at 45 minutes filled back up quickly so we seem to be on track. Another at 1 hour filled up halfway and slowly so this indicated the dough was ready. Had it not filled up at all, we’d be overproofed again. Fortunately, the temperature in the kitchen was about 22ºC (71ºF) so we weren’t fighting a heat wave like last week and the proofing was pretty much as expected. The loaves were turned out onto a baking sheet with parchment and a little coarser cornmeal for the bottom of the bread, then slashed. Other people have done this without slashing so this may be a soft enough bread to not need it. As you can see in the photo, the bread spread out a bit showing it is a rather soft loaf. Into the oven they went (sans stone but with steam) for an estimated 40 minutes. At about the halfway mark, I switched the loaves around to make sure they were evenly baking. Although there was definitely oven spring, there was less than I had hoped. I’m not certain this was a ‘mistake’ or what this bread does, it seems other Mellows had similar results: fair oven spring but not a huge amount. I pulled the loaves out when they seemed a nice colour but once more, it looks like my dark baking pans are doing a number on the bottom of the loaves: they came out rather dark, nearing scorched. The internal temp was 205ºF, a bit higher than it likely needed. Note to self: Put the dark tray on top of another to help insulate! 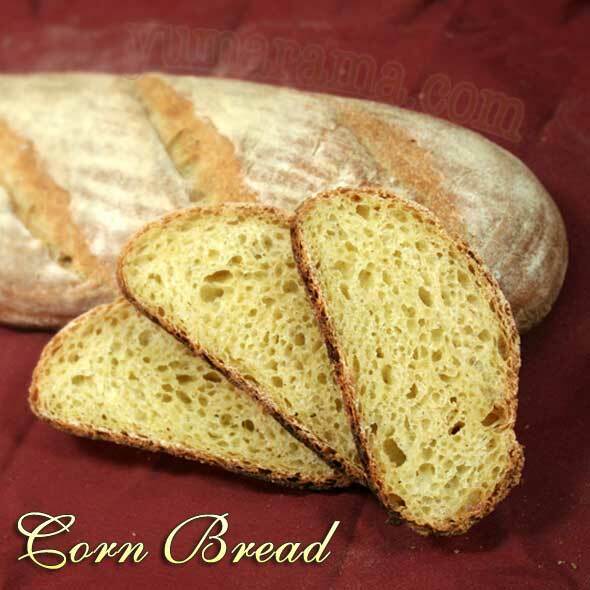 This bread has a very nice, even but still open crumb and a lovely colour from the corn. The crust would probably have been a little improved with a shorter bake time; it seems a little deeper that a tender bread like this could use. the flavour is subtle but still notably different. All in all, ’tis a pleasant bread and one I wouldn’t have a problem repeating. This bread has been YeastSpotted. 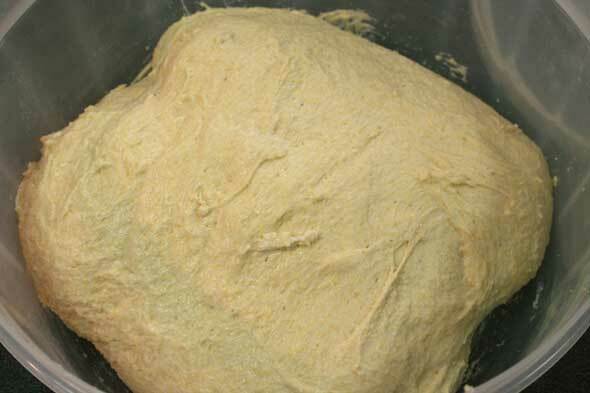 • A poolish is always made with equal parts water and flour by weight so it is 100% hydration. It has no salt and uses commercial yeast. 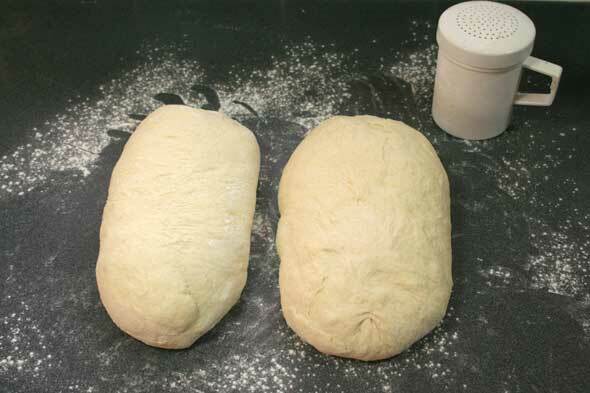 • While a Biga also contains no salt, it is usually from 50-60% hydration so it is more like a stiff bread dough. • Pâte Fermenté, wether taken from a previous bread dough or mixed up specifically, can be any hydration and contains yeast. 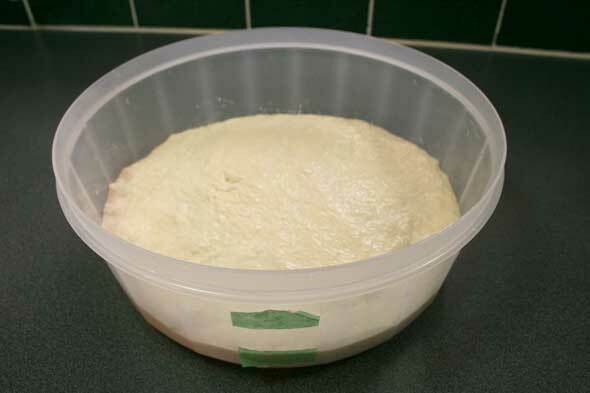 • Sourdough starter or levain, of course, requires a natural yeast inoculation. 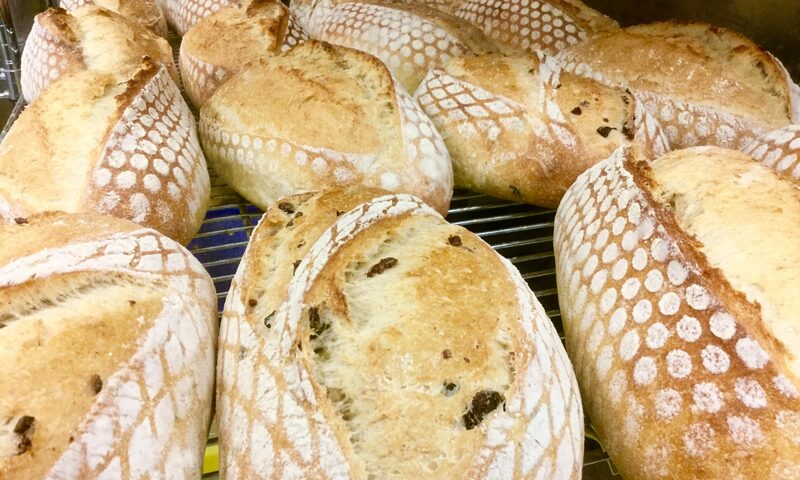 Very nice looking loaves. I suggest blackberry jam. Although rumor has it,, one of the best things about coming home from college is fresh bread and peanut butter in the morning. I used a medium grind cornmeal, which may take more space. One more reason for using weight, which is what I do. 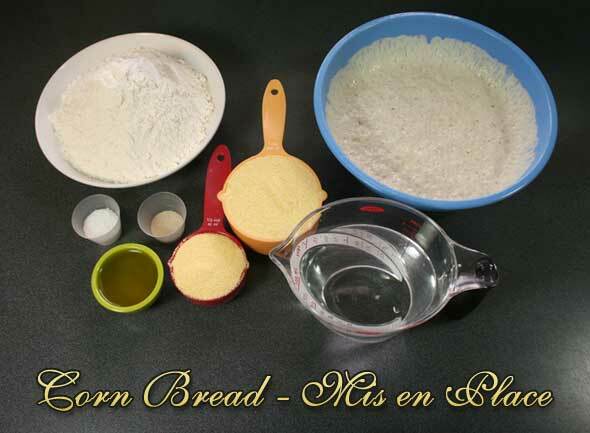 .-= Anne Marie’s latest blog post: Corn Bread =-. They look beautiful! 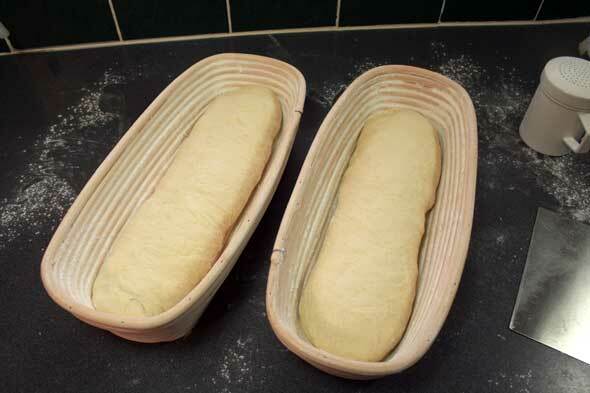 I really like how your loaves look from the proofing baskets . . . I finally caved and ordered a couple yesterday. Also glad for the heads-up on the taste . . . When I read “cornbread,” I immediately thought of the chili-and-cornbread quickbread stuff. Now I’m trying to figure out how to pair these for a meal in the next week or two. 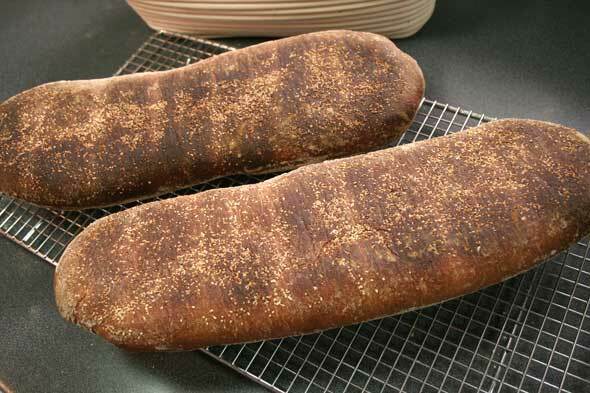 .-= Abby’s latest blog post: Vienna Bread (BBA #39) =-. They turned out great! I love the yellow tone of the crumb. .-= Oggi’s latest blog post: KULINARYA Puto =-. Mmm, looks good. I love the color of the interior. 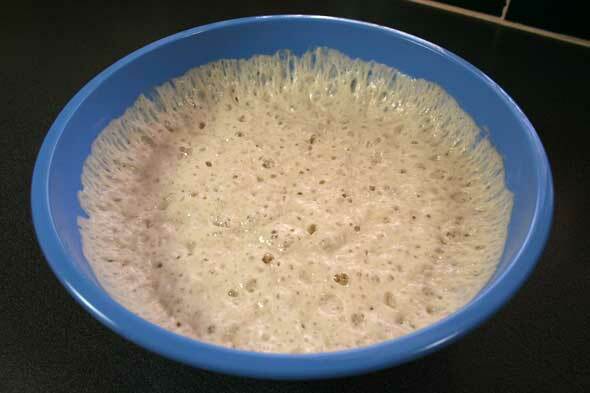 I really want to make this one; may start the poolish tonight. .-= Di’s latest blog post: We all scream for ice cream =-. Your posts are so clear and I love the mise en place. I have only done that a couple of times and usually for cake with loads of ingredients. I really like the bit about writing the weight of the tub on it, I might have to write a list of what the bowls I usually use weigh as I am always lifting dough in and out, weighing the bowl, zeroing the bowl. Maybe to be mellow one needs to be a bit more organised 🙂 The crumb looks perfectly judged, really even and lovely! Just great Paul! The cornbread looks great, the the yellow colour of the crumb is stunning. 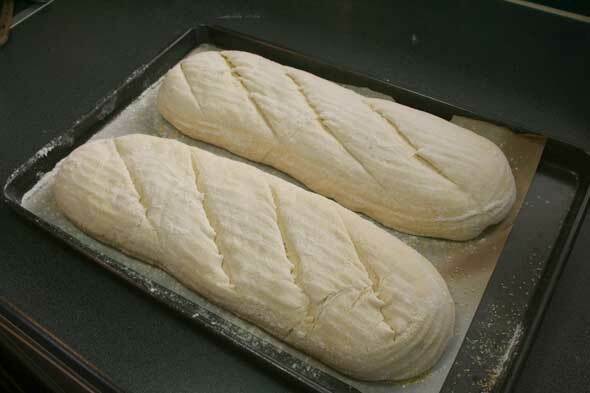 .-= Stefanie’s latest blog post: No bread today =-. I love that book, Bread. I must try these. I dig the idea of making everything in it. Thanks for sharing. .-= Roger’s latest blog post: Oven-Braised Leeks with Orange and Fresh Thyme =-. Wow! I have too many bread books and I think you are talking me into another one. These loaves look fabulous! .-= Mimi’s latest blog post: How to make cocoa powder feel decadent =-. Thanks everyone for the lovely comments! If you haven’t yet, do give this one a try – you will of course need the book… And why not join MellowBakers too. Do what suits you, skip what doesn’t. No pressure baking! The Corn Bread is a yeast bread so there is no sourdough starter in it. However, it is a poolish pre-ferment which means it’s 100% hydration (equal weights of flour and water) plus a tiny bit of instant dry yeast. In the poolish we have 227 grams (8 oz) of flour and water (each) plus 1/8 teaspoon instant dry. You can therefore substitute this with a sourdough of the same amount, 454g at 100%. You’d have to account for the longer fermentation and proofing that your wild yeast requires, of course.